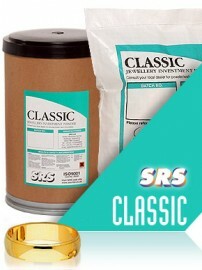 SRS Classic is the reliable solution for all gold, silver and brass castings. It incorporates the highest quality unmineralised cristobalite to ensure an excellent surface finish and defect free casting time after time. Flexible in use and easy to clean off after casting, it’s the totally reliable answer to a whole range of applications. SRS Investment Powders have been used by the jewellery industry worldwide for over 26 years, the products are suitable for mixing by hand or machine.